Are you upgrading or downgrading your home? Whether you're cleaning out the attic or the entire house, it can be a tedious project. Maybe you've bought a home in a foreclosure and now you have the arduous task of cleaning it out room by room. Not only can this take days, but it can sometimes take weeks to get through all the debris and junk that others have left behind. You may also be doing a gut renovation on a new home which may require cleaning everything from the attic to the basement. While the home improvement shows make it look easy, you may not know where to begin. A good place to start is with 1-800-GOT-JUNK? so we can help you remove all the junk, metal, old appliance and anything else you want hauled away. 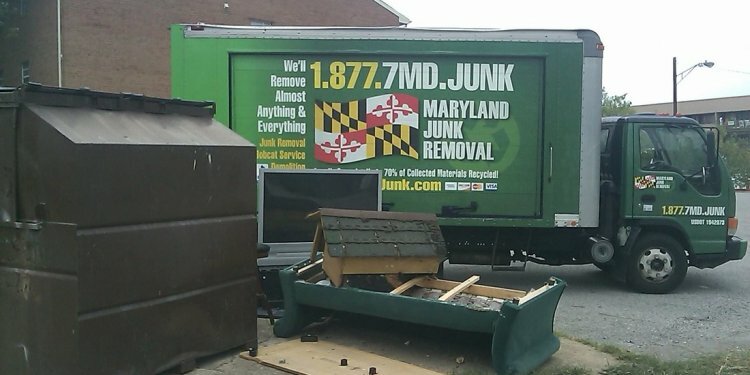 If you need junk hauling, Silver Spring MD residents use 1-800-GOT-JUNK?. We're the most reliable junk hauling service that can come out the same day and get rid of your junk – ASAP! Just point and junk disappears! When you remodel a home or clear out its clutter, one problem that you may find is that not everyone will take all the junk you have. A local pick-up service may ask for a description and then tell you what they won't accept. You can also find that if you leave your junk curbside, not only is it an eyesore for days until trash day, but your local trash removal service may not accept everything that you're throwing away. When you're to start your project, just contact 1-800-GOT-JUNK?. Not only are our movers reliable and friendly, they can carry the heavy stuff for you! Another really great reason to use 1-800-GOT-JUNK? is that our movers know how to sort and recycle all kinds of junk. When we talk to you, we'll set up a time to come to you at your convenience, discuss what you want to have moved and we'll show up on time when you're ready, too. With one price that you pay for everything, you never have to worry about hidden fees or extra surcharges. If you live in Silver Spring, dumpster rental is always an idea, but again, they may not take all of your junk. Don't worry, we recycled before it was cool and we'll take everything you have, sort it separate it and recycle what we can to help the environment. Another great project for gutting a house or just cleaning it up is to have a yard sale. You can make a little extra money and get more storage in your house. The only problem is what do you do with all that junk that you can't sell? For fast junk removals, call 1-800-GOT-JUNK? and we can come out the same day to take all that extra "stuff" off your hands. With our same day service, you'll find that we'll be in and out in no time. That way you've accomplished your goals: You've cleared out the junk, made extra room and money, too! The added bonus to hiring 1-800-GOT-JUNK? is that we pick up and haul away all the junk you give us. When you rent a dumpster, you have to haul the heavy loads outside yourself and not only lift them, but hoist them into a dumpster. That weekend project can then turn into one that may take longer than you anticipated. A lot of injuries can also result from picking up heavy appliances like old air conditioners, old TVs and other bulky items. We offer same day service and we will take anything so long as its non hazardous and 2 people can lift it. Call 1-800-GOT-JUNK?! We're happy to help!